Watch Trans-Nebraska Players on YouTube. 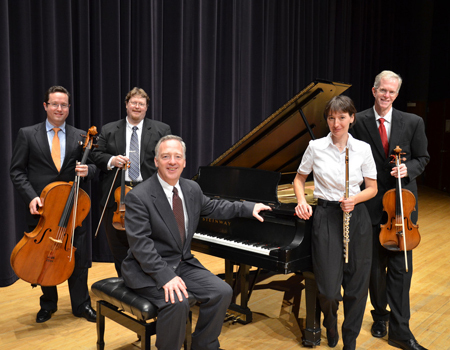 Trans-Nebraska Players offers chamber music recitals and musical entertainment, primarily focusing on Baroque, Classical, Romantic and Contemporary Art styles of music. Founded in 2008, the group has performed throughout Nebraska, as well as California, Louisiana, Iowa and Toronto, Canada, and in venues such as the Sheldon Museum of Art, Montgomery Arts House Malibu Coast Music Festival and the National Flute Association Conventions in New Orleans and San Diego. The group has performed live on NET Radio for Friday Live and The Verge and has commissioned works for several contemporary composers, including Pulitzer-Prize nominee Maria Newman. Technical requirements: If performing as a quintet, the group requires a well-tuned piano in good repair and regulation (preferably not an upright piano). Prefer four music stands and chairs provided by the venue. If performing as a quartet, no piano is needed. Availability: Some limitations may occur.